Silly Bee's Chickadees: Girls are Girls After All! Girls are Girls After All! Do you waste valuable time waiting for nail polish to dry? Do you like to look ridiculous? I thought so! 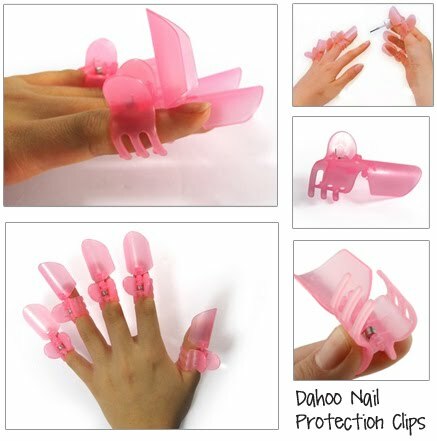 Have I got a product for you... the Nail Protection Clip by Dahoo. No, this not an SNL spoof. This is fer real, chickadees. Read on. "Do you like to match your nail paint color with your wardrobe often? Then that requires more patience than sheer labor, as it`s easy to paint your nails. It is way more difficult to keep the paint on intact without smearing or smudging it. Most women can`t manage that part with the busy schedules and bad time management. But girls are girls after all and all they need is a solution for their problem! The nail varnish protection clip is a plastic clip holding on to your finger as a protective cover that avoids your wet nail polish from smearing. Smart DIY nail art tool, no messiness anymore. Special transparent lifting-cap design – you can see your painted nails clearly at anytime. Achieve perfect artificial nails and no worry smudge. Split jacket, use your fingers are still nimble nature, you can phone, reading books, playing on the computer, etc." Wait a minute, you mean instead of sitting down and waiting for my nails to dry I can be sitting down waiting for my nails to dry while wearing mutant hair clips on my fingers? And just in case I want to make sure my nails haven't fallen off, I can lift the cover to check on them? Unbelievable! It's the bad time management cure I've been searching for! Too bad I didn't invent them-- I'd be a millionaire, fer sure.